Nearly 80% of bats echolocate. Acoustic monitoring provides a means by which bats can be monitored in a non-intrusive way. The development of passive recording systems has seen this type of hardware becoming more widespread in recent years, and their affordability means that vast amounts of data can be collected relatively inexpensively. However, its widespread use has been curtailed by the challenges of robust identification of acoustic signals and the generation of meaningful statistical population trends. A research project recently published in PLOS Computational Biology, looked at developing algorithms that can be used to detect bat calls amongst noisy audio recordings. 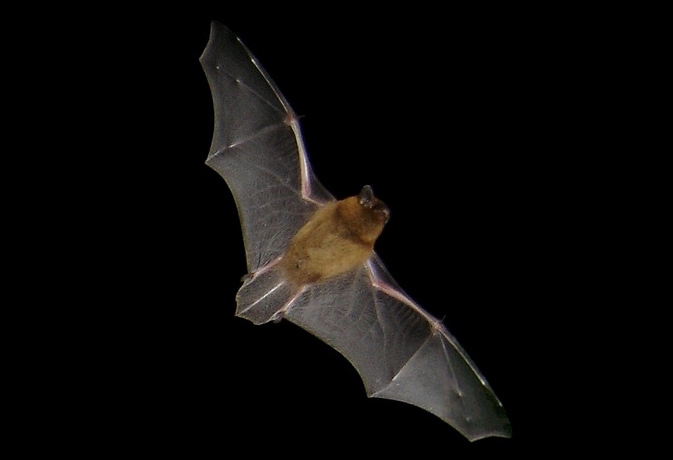 The deep learning algorithms were trained on full-spectrum ultrasonic audio, which was collected along road-transects across Europe and labelled by citizen scientists from the Bat Detective Project. Using recordings from the Project meant that researchers had large amounts of data that they could use for ‘training’ purposes. Up until now, tool development has been hampered by a lack of large scale audio datasets, intraspecific variability of bat echolocation signals, and the range of different recording devices being used to collect data. There are a few inherent problems with current detection methods. Detecting search-phase calls by manual inspection of spectrograms tends to be subjective, highly dependent on individual experience, and its uncertainties are difficult to quantify. There are a number of automatic detection tools now available, which use a variety of methods; however, there is very little published data available on the accuracy of many existing closed source commercial systems. This reliance on poorly documented algorithms is scientifically undesirable, and manual detection of signals is not scalable for national or regional survey and monitoring. In addition, there is the danger that manual detection and classification introduces a bias towards the less noisy and therefore more easily identifiable calls. To address these limitations, a freely available, transparent, fast, and accurate detection algorithm that can also be used alongside other classification algorithms is highly desirable. The researchers succeeded in developing an open source system for automatic bat call detection in noisy, real world, recordings. They used the latest developments in machine learning to directly learn features from the audio data using supervised deep convolutional neural networks (CNNs). This is the first time CNNs have been applied to bat monitoring. BatDetect CNN algorithms outperformed all other algorithms and commercial systems tested, with consistently higher average precision scores and recall rates across three different test datasets that represented challenging, real-world monitoring scenarios. In particular, the BatDetect algorithms were better at detecting calls in road-transect data, which tend to contain noisier recordings, suggesting that these are extremely useful tools for measuring bat abundance and occurrence in such datasets. Noisy sound environments are also likely to be a problem for other acoustic bat monitoring programmes. For example, with the falling cost and wider availability of full-spectrum audio equipment, the range of environments being acoustically monitored is increasing, including noisy urban situations. Individual bats further from the microphone are less likely to be detected as their calls are fainter, and high ambient noise levels increase call masking and decrease call detectability. Additionally, a growth in open-source sensor equipment for bat acoustics using cheap MEMs microphones may also require algorithms able to detect bats in lower quality recordings, which may have a lower signal to noise ratio or a reduced call band-width due to frequency-dependent loss. The nature of the open-source, well documented algorithms enable biases and errors to be directly incorporated into any acoustic analysis of bat populations and dynamics. The detections with BatDetect can be directly used as input for population monitoring programmes when species identification is difficult such as the tropics, or to other CNN systems to determine bat species identity when sound libraries are available. The team is now working to develop systems that can extract more fine-grained information from audio recordings, such as the presence of specific bat species. About the Author: Kate Priestman (CEnv, MCIEEM) has over sixteen years experience as an ecologist. Prior to setting up her own consultancy business in 2012, Kate worked in London for over a decade, providing the lead ecology role for a number of high profile projects. Kate works as an artist, author, writer and editor. How much nature is lost due to higher yields? Enjoy Inside Ecology? Please donate a few ££/$$ and help fund us. There are numerous advertising and sponsorship opportunities available on Inside Ecology. Please visit our advertise page for more information and info on how to obtain our rate card. Copyright © Inside Ecology Ltd 2019 - All rights reserved. Inside Ecology Ltd is a company registered in England and Wales. Registered office: Stanley House, 49 Dartford Road, Sevenoaks, Kent TN13 3TE. Company number: 08260167.